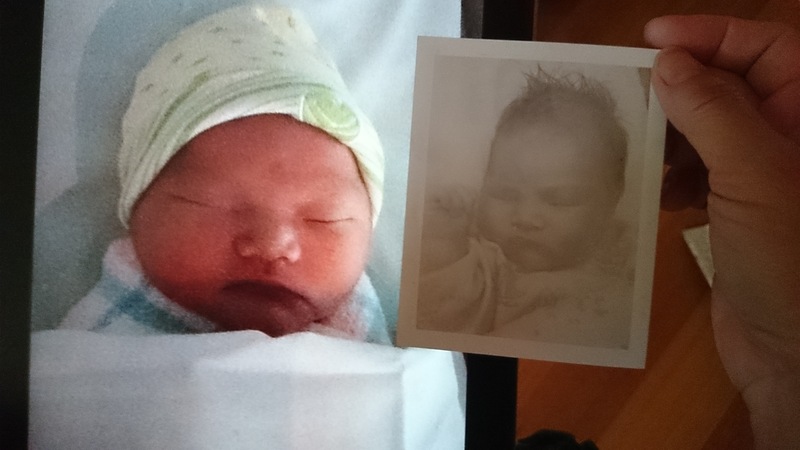 Elan on the left, and an old Polaroid of me (Caesar) when I was a baby on the right. Jenny and I are absolutely pleased as punch to announce that not only are we with child, we had the baby on Sunday morning, 29th December 2013. Sorry for keeping him a secret from you, internet; we’ve been disappointed in the past and so wanted to keep something so very precious to us private. What are the gory details? Elan was born on the morning of 29th December 2013, weighing 3.86 kg (8.52 lbs). He’s a big baby – his head circumference was 37cm which supposedly puts him in the ~95th percentile. Winning! How do you pronounce Elan? EE-lun (IPA: /’i:.lən/) – essentially “Ian” but with an “L” shoved in, not the regular English word. Where did you get the name from? You named your son after a stick figure? Yep. It’s from a brilliant, if slightly nerdy, web comic. Check it out: http://www.giantitp.com/comics/oots.html. No particular reason; I like it because it’s relatively unique without being too “out there”. Does he have a Chinese name? My parents have helped us to choose 黃栢延 – we haven’t settled on the romanisation yet, but it’ll probably be “Wong Pak Yin”. I’ll have to figure out what it is in Korean too… will update this post when I figure that out. Does Rich Burlew know you named a kid after one of his characters?